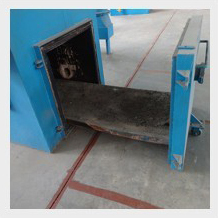 HICLOVER, Nanjing Clover Medical Technology Co.,Ltd, supply system solutions for medical environmental protection, animal and pet cremation engineering, other municipal solid waste incineration project. Our range of incinerators cater for small to large scale animal cremation related businesses, such as poultry farms, cattle farms, sheep farms, pig farms, stables, kennels, testing laboratory, catteries, pet crematoriums. The incinerator burn waste in primary combustion chamber and burn the smoke from primary combustion chamber again to make sure environmentally friendly with no black smoke, smelless, reduce pathogenic bacteria infection. 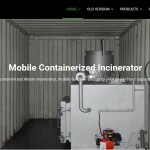 The containerized mobile incinerator mounted in ISO container before leave factory, pre-installation, no incineration house build construction, movable by truck and ultraviolet lamp sterilization inside. HICLOVER is growing brand for environmental protection field, and market share with most of Africa, Middle East, Southeast Asia countries and part of North America, Europe territory. We a re trusted partner for governmental organizations, non-profit organizations, international contractors, logistics organizations, military, pet cremation business owners, etc. We have export experience more than 40 countries, including war zone like Iraq, Afghanistan, Somalia, South Sudan. 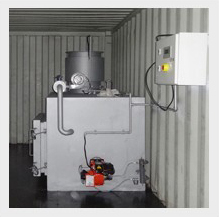 We are china incinerator manufacturer, contractor and exporter. 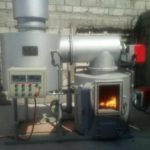 Manufacturer make reasonable price for incinerator customer, supply medical incinerator, hospital incinerator, animal incinerators, hog incinerators, pet cremation equipment, small incinerator, pet incinerator, animal incinerator, portable incinerator, small animal incinerator, infectious waste pyrolysis machine, laboratory incinerator. HICLOVER help customer reduce purchase budget, custom made function, quality products and friendly service. Should have a full width counterbalance loading door allowing easy access to the main chamber for loading and removing ash. The INCINERATOR should be NEMA approved in accordance with Environmental management and coordination (Waste management) Regulations of 2006. The work specified in the contract will include. To enable the Employer undertake conclusive evaluation of the tender, tenderers are requested to submit with their offers the detailed specifications, drawings and catalogues with Commissioning and maintenance instructions for the Incinerator they intend to Supply, install and commission. Tenderers who fail to comply with this requirement fully shall have their tender rejected. Controlled hygienic mechanical feeding that does not negatively influence the air temperature in the primary and secondary chambers of the incinerator shall be used. Ensure secondary air supply is controlled. Ensure residence time is not less than two seconds. The chimney should have a minimum height of 10 meters above ground level and clear the highest point of the building by not less than 3 meters for all The topography and height of adjacent buildings within 50 meters radius should be taken into account. 100 where Win = mass feed rate of the POHC in the waste stream fed to incinerator and Wout = mass emission rate of POHC in the stack prior to the release to the atmosphere. Up to 20kgs per hour (dependant on application). Basic Plan design to Provide Overall plant layout. With Feed chamber/ charging, Primary Combustion Chamber. Secondary Combustion Chamber. 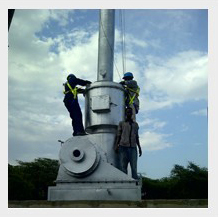 Particulate Scrubbers, Acid Gas Scrubbers, The stack/ chimney. Chimney Height should be of 10 meters above ground level. Safety interlock, Fan Starter, Burner on/ off switch/door safety switch, Auto close down switch, temperatures control mechanism. 9. Supply of Operation and Maintenance Manuals. 10. All other items not specified but necessary to complete the Installation. A separate list of these items to be attached. Could you please send us cataloge detail for Pet Cremation of dogs, cats. for your products, technical transfer and training for operators. dressings, plastic test devices and other wastes. Large counter-balanced fill door with electrical lockout. Automatic control system provides preset burn times and shut off. Reload light indicates to operator when it is time to recharge. Be required for burnout of final charge. Programmable digital temperature controls maintain temperature, assuring complete combustion while conserving fuel.  Pressure blower with modulating air control creates turbulence and distributes combustion air to secondary chamber. performance at low energy consumption levels. Supplied with a 500 liters fuel tank and all necessary accessories for installation. 2. Working hour /day: minimum 10 hours/day. 3. Capacity: Approximated 150 kg/hr. Over 10 hrs. · BULK density: 70 – 100 kg/ bm³. · Calorific value: 2000-3000 kcal / hr. · Moisture content: 20-30%by weight. · Ash content: 2 – 8 % by weight. · Plastic content: 15-20 % by weight. 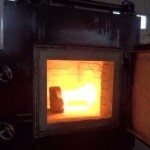 · First chamber: not less than 700 – 800 °c. 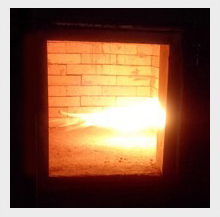 · Second chamber: not less than 1200 °c (during steady operation). 7. 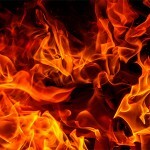 The burners should be automatically switched off if any of the combustion chambers doors is open. 8. The burners of the first and second combustion chambers are selected for burning diesel oil (light fuel). 9. Automatic loader and unloader to be provided. 10. Exhaust gases to be comply with International Environmental code and requirements. 1 metre high One (1) year warranty. 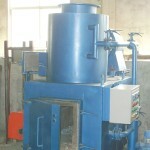 Two-compartment incinerator with a capacity of 20 kg / hour. electromagnetic locking of the door. at least 1100 ° C.
Carbon residues in ash less than 5% by weight in accordance with European Directive 2000/76 / EC. 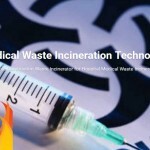 1/ Cost of a 200kgs/Hr medical waste incinerator.